Address Plaque with Monogram - - arch shape address sign personalized with a large one-letter monogram above the address. Made in USA. Fast turnaround; ships in 1-2 days. Wall mount. 16"W x 11.75"H custom sign with an exceptionally awesome monogram and your one-line or two-line address. Sturdy, UV-stabilized 1/8" thick laminated acrylic construction with engraved wording, image, and border. Available with either a one-line or two-line address. The one-line sign holds up to five (5) 4" numbers or eight (8) 3.5" numbers. The two-line sign holds up to five (5) 3.5" characters on Line 1 and twelve (12) 1.5" characters on Line 2. If you want a one-line sign, please leave the Line 2 input box empty. 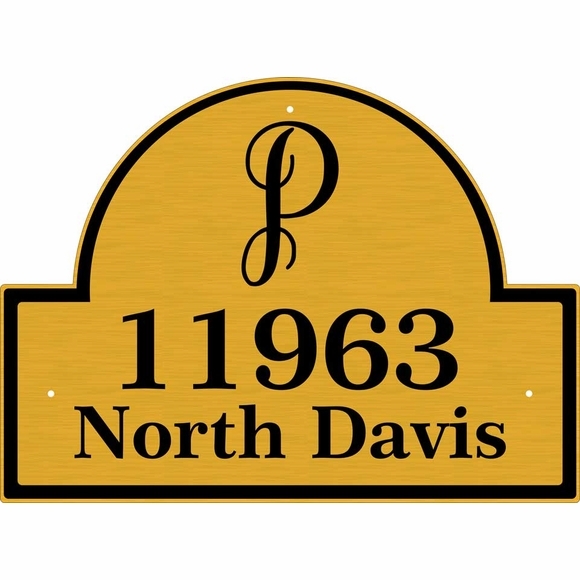 Arch shape address sign personalized with your initial and address. Made in USA.